How to display your own picture or any images to replace mystery man and very useful if you comment in other blogs as your image will shows up while you’re commenting. I was thinking if i can change the grey default avatar which is called Mystery man to something else. In my case, I want to change it to my own Picture. I finally found out how. This tutorial i made with wordpress 2.9.2, however it will work with wordpress 3+ (now wordpress 3.0.1). Until now, none Jauhari 🙁 but Thanks for this, if you dont tell me i wouldn’t know. So I will try to post some without videos. I remember how slow and expensive the connection in Indonesia a few years back. Greetings thanks for commenting, you are my first commentator, how i happy i am lol! Anak Indonesia 🙂 Which line i should edit? Nice blog I am sure you will make it 😛 Do you only present videos here? Hey Julius, Thanks that you left a comment, encourage me, and coming by 🙂 No, I don’t only present videos, there are some tips which I wrote, but those are simple and short one:) I live in Baden Wuerttemberg, sure I kow Freiburg, one of our family lives in Schwarzwald, we go there sometimes:) keep in touch, greetings from the south. Thanks for leaving a comment. I watched the video again just now, and i was so slow in video 😀 but i am so glad it was a help 🙂 i will try to be better, greetings from Germany. Thank you for this particular useful post! Furthermore, i have got a weblog and i’m thinking, where can i download these kinds of fantastic theme like your own? Hey Scenografia, Thanks that it was useful for you, unfortunately i created this theme and it’s not yet downladable 🙁 But don’t worry, there are bunch of nice themes out there, Greetings! this video last night and it worked perfectly! YAY!!!! Thank you for the instructional video! Thanks for this great video…it works. I was banging head for long time to change the image and what i found is 10000 plugins which let my user’s to change their image not mine. but ur idea worked for me. 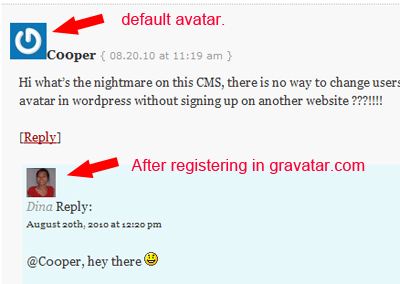 Hi what’s the nightmare on this CMS, there is no way to change users avatar in wordpress without signing up on another website ???!!!! I have tried using Joomla, but i prefer wordpress and i love it. Great to see an image of your avatar! Thank you for leaving a great encouraging comment Allan. Thanks for the help it’s much appreciated. me blundering across the internet. lol. Thank you! This was easier than I thought. Your video helped me a lot. I am tweaking few more settings too. Thanx for the help.